Older Swansea fans (like me!) 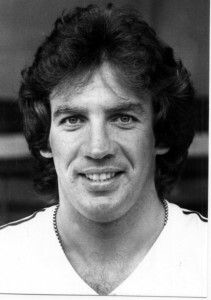 will be familiar with the name of Alan Waddle, who scored 34 goals in 90 appearances for the Swans over two spells at the club during the late seventies and mid-eighties. A cousin of ex-England wing Chris Waddle, the Wallsend Boys Club product was a team-mate of John Toshack in the Liverpool side of the 1972/72 season. Although never really making a name for himself at Anfield, his one and only goal in 14 appearances was an important one – the winning goal in the Merseyside derby at Goodison Park in 1973! Perhaps unsurprinsingly, it was Toshack who signed Waddle from Leicester City in May 1978 for £24,000 and he quickly went on to become a favourite with the fans as his first season saw him finish as leading scoring with 19 goals. His goals helped the Swans secure promotion from the Third Division during the 1978/79 season. Waddle was known for his strong aerial ability but as the seasons passed at the Vetch Field, he struggled for form and his place in the side became uncertain. In December 1980, Waddle left the Swans and headed to Newport County for £80,000 – which still remains the Gwent club’s record paid fee to this day. Despite scoring on his debut for County, Waddle struggled for goals and found himself trying to recapture his goalscoring habit at Mansfield Town, Seeb (in Hong Kong), Hartlepool United, Peterborough United and then Hartlepool once again. In March 1985, Waddle returned to the Swans for a second spell on a non-contract basis. Although he wasn’t as effective as he was in his initial spell at the Vetch Field, the experienced Waddle was still a handful for defenders. With the Swans suffering off the field financial problems at the time and relegation to the Fourth Division confirmed, Waddle was given a free transfer by the Swans. The late 80s saw Waddle plying his trade in the Welsh League for Barry Town, Llanelli, Port Talbot, Maesteg Park and Bridgend Town. After leaving the professional game, he did spend some more time at the Vetch Field as the club’s Commercial Manager before going to Swansea Institute to study computer programming. A career in IT beckoned and after working for the Siema Corporation on Merseyside, Waddle emigrated to Australia, where he can now be found coaching amateur side Demon Knights. Can you remember 6ft 3″ Waddle wearing the white shirt of the Swans?